Do you die from Parkinson’s? Short answer: Parkinson’s progresses slowly and as such is not considered a fatal disease, but it does significantly increase mortality, particularly among elderly patients. Longer answer: I’ve heard variations of this quote a number of times, from both patients and clinicians: “You don’t die from Parkinson’s disease, you die with it.” This is true in the sense that a death certificate will rarely list Parkinson’s as cause of death. And it is certainly true that Parkinson’s progresses slowly, and many patients die from causes entirely unrelated to Parkinson’s, such as heart disease and cancer. However, deaths from complications related to advanced Parkinson’s can and do occur. The most common by far is pneumonia, caused by difficulties in swallowing, which apparently is a contributing factor in death for over 40% of all Parkinson’s patients (see, e.g., these studies in Japan and the UK). There is some literature on ways to reduce swallowing problems, which I will try to summarize at some point. 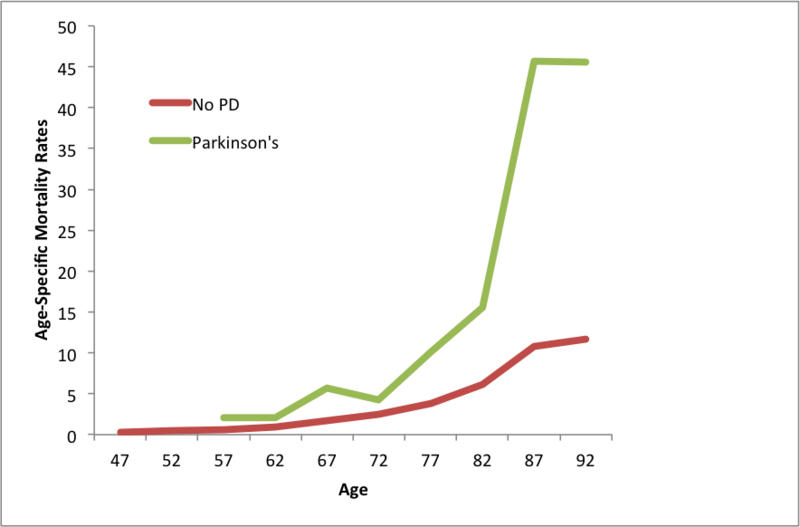 So, while the question of whether you die from Parkinson’s could be viewed as a semantic issue, it is also possible to address the question quantitatively: Do people with Parkinson’s have the same risk of death as people of similar age who do not have Parkinson’s? Or a slightly different question: What is the life expectancy for someone diagnosed with Parkinson’s, and how does it differ from someone of similar age who doesn’t have the disease? Surprisingly, these very basic questions are still not entirely nailed down. The results in the graph below were obtained in a large, long-term study performed in Hawaii. Basically, it shows that people with Parkinson’s, ages 55 and up, have an increased risk of death in any given year relative to people without the disease. The increased risk of death is largest in both absolute and relative terms for patients older than 85 years (who in many cases have also had the disease for many years). Risk of death for people with (green) and without (red) Parkinson’s disease. Data from the study discussed above. There has been some controversy, with a few studies giving conflicting results, but most large, well-designed studies give a similar picture (examples 1, 2, 3, 4). Mortality rates can be a bit abstract, and this article instead gives numbers in terms of life expectancy. Roughly speaking, their numbers show that early-onset diagnosis of Parkinson’s leads to a reduction in life expectancy of about 10 years (from ~80 for the general population to ~70), while late-onset reduces life expectancy by a few years. This may seem counter-intuitive, because early-onset Parkinson’s is associated with slow progression. But the small magnitude of the reduction in life expectancy for older patients is primarily because the risk of death from other causes increases greatly.